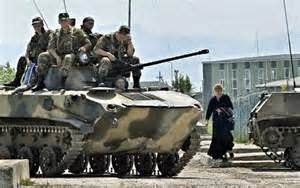 War In Ukraine A Bad Idea! World War III is becoming a reality. As insane as it appears this could become the final outcome. The location of this as a military confrontation is right in Putin's backyard and this is a strong advantage for Russia. It is silly to think Putin and Russia will back down. This means poking the bear is not a smart move. We are being bombarded with hype and spin. It is almost as if events are being magnified to take the eyes of the American people off what is happening here at home. The "pro-Russian" Ukrainians that were recently killed have been labeled as "terrorist" and both sides are engaged in a war of words. “Henchmen” of the Kiev government with the backing of Western nations are organizing terror attacks, Russia's Ambassador to the UN said at an emergency session of the UN Security Council. Russia “is spreading fiction, we must stop this tonight,” is the line mouthed by U.S. Ambassador to the United Nations Samantha Power. Washington and the Obama administration have been quick to embrace a new unelected government in Ukraine as allies forgetting they were small bit players before the coup. We have even gone as far as giving these clowns economic support to wage their civil war. The interim Prime Minister Arseniy Yatsenyuk is the new face of Ukraine and he appears almost nightly on television screens across America beaming with new found self-importance as a world leader telling us to restart the cold-war and how it is America's duty to protect the people of Ukraine. It cannot be emphasized enough the military of the country is both divided and extremely weak. The IMF has joined us in this folly and more insane is that the money will most likely find its way into Russia to pay for natural gas on which Europe relies. Recent meetings in Washington of the International Monetary Fund and the World bank showcased the reluctance of European allies to impose stronger measures against Moscow. Concern runs high in Europe about the economic repercussions of penalizing their major trading partner and energy supplier. Europe is where the fighting would take place and they bear the brunt of any action. The now infamous phone comment, "F— the E.U.," by U.S. Assistant Secretary of State, Victoria Nuland speaks volumes as to who is pushing an agenda of confrontation. Sadly, I must admit that I have even seen articles about how a war is what we need to pull the world out of its economic malaise. The comparisons of Putin to Hitler are being made and it is touted that once he starts expanding he will never stop. One article pointed out the vast energy deposits that lay under Ukraine as a reason to stand firm, the same argument was put forth concerning Afghanistan. It almost seems that warmongers have no limits to how far they will reach to stir up patriotic fervor. We have heard the totally impractical idea we could sell Europe natural gas replacing Russia as their supplier. Imagine this as the "mother of all sanctions" they are implying that we could make money while solving the problem for Europe and at the same time we weaken Putin. In all this muddy water there is the issue of hypocrisy. After many of the actions taken by America under both the Bush and Obama administrations it is hard to claim the moral high ground. Drone strikes, NSA spying, how we have treated prisoners at Guantanamo and more have made it difficult to claim we are the good neighbor. Bottom-line it is best to stay out of certain situations, this is really important when you are not dealing from a position of strength. Footnote; As always your comments are welcome and encouraged. I also urge you to visit the archives for other articles or topics that might interest you. The two post below delve into the important issue of sovereign borders and why Putin will not back down. our unrelinquishing desire for growth is placed in front of longer term issues and needs. Mapping out a logical and sustainable long-term plan requires delving into some rather hefty philosophical questions like what brings real happiness. We would have to think about what kind of society and world future generations might want to live in. We would have to recognize the role of the human animal in the overall scheme of things. Jeremy Grantham’s investment firm GMO manages about $110 billion in assets. He also backs the Grantham Institute of Climate Change at London’s Imperial College. He says population growth is a huge “threat to the long-term viability of our species when we reach a population level of 10 billion” because it is “impossible to feed the 10 billion people.” Billionaire Bill Gates says we should cap global population at 8.3 billion at the same time his vaccine and other programs are extending life expectancy. Columbia University’s Earth Institute Director Jeff Sachs says even 5 billion is unsustainable. To stop adding more people our population is tough enough. But how do eliminate two billion from today’s seven billion total? Voluntary? As the world continues to develop the importance of design and quality are factors that cannot be stressed enough. An issue we are failing to address is that as the world's population soars we cannot afford the wasteful luxury of constructing buildings that grow obsolete or must be replaced every few decades, buildings should last for centuries. How we use our new skills and the choices we make will determine if mankind blankets the world with Las Vegas style resorts on every corner, fills the skies with glass towers, or constructs homes and shelters suitable for our fellow man. “One of the disturbing facts of history is that so many civilizations collapse,” warns Jared Diamond, environmental anthropologist and author of the classic “Collapse: How Societies Choose to Fail or Succeed.” Many “civilizations share a sharp curve of decline. Remember this is totally entwined with the economy and everyday life. Indeed, a society’s demise may begin only a decade or two after it reaches its peak population, wealth, and power.” Can it be stopped? Before it’s too late? Don’t bet on it. Watching how Washington solves and deals with real problems is not encouraging. Footnote; The above article is not an endorsement of the carbon tax as much as it is a call for better planning and less waste. This post dovetails with many of my recent writings, for more I might suggest reading the articles below. Other related articles may be found in my blog archive, thanks for reading, your comments are encouraged. Creating jobs in a mature market should be required to pass a certain "taste" test. It should be pointed out that while America is creating jobs it is costing a huge amount. I'm referring to the massive government deficit which I feel is the fuel driving our still rather weak growth. Is it sustainable, and just as important are these the right kind of jobs and will they last? When a job that falls outside the description of government worker fails to make economic sense it becomes a form of working welfare with the taxpayer picking up the tab. We as a country and as a society have paid dearly for each unsustainable job created through government incentives and partnerships, because of the nature of many of these jobs we might even call them temporary. A great weakness in government generated jobs is after a huge outlay to set up, or put them into action, they often do not create or contribute to production. If these jobs are not asked to continually justify their cost, and they often are not, they merely become another burdensome cost to society. The feeble efforts to think through and link a job to a sustainable economic base that creates a needed product or generates real value is a major flaw in most government aided ventures. Once started government sponsored ventures are often slow to react or adjust to economic reality, this can be seen in the Postal Service and its inability to drop Saturday delivery. Two examples of government over involvement come to mind from here in the city in which I live, the first I will call Kitty Hawk. In Fort Wayne, Indiana years ago the city aggressively backed a bond and the loan to build a massive hanger at the airport for an air-freight company named Kitty Hawk. The city lured the company to the area because it promised a slew of new jobs where they located their hub, the company is now bankrupt and the jobs are gone. The taxpayers of Fort Wayne are now paying for an empty hanger that they are trying to lease at a "aggressively" low price. This hurts those private investors and property owners that lease building space as they are now forced to compete against the government to which they are forced to pay taxes. The other mind boggling, and hard to defend venture is the city's pathetically under used money losing bus system, Fort Wayne Citilink. Everyday buses running their predetermined routes crisscross the landscape of the city at an operating cost of over $6 a vehicle mile averaging only 1.15 riders per mile traveled. It is more common to see a bus completely empty then carrying any passengers. Funded by Federal monies as well as local real-estate taxes, most people give little thought to this economic failure. One could site that the poor or those without transportation need this service, but the cost of this inefficient system is huge. Burning through fuel and polluting the air as they transport so very few riders, it is hard to argue that they make the city green or that the jobs are economically sustainable. Another way that governments hurt local businesses is to invite a company like Amazon into their community by offering tax incentives to construct a distribution center, as a way to encourage investment, or get new jobs. This often puts a dagger into the hearts of existing businesses. Anything that gives one company an unfair advantage over another tends to lessen the ability of the other to remain competitive, this often results in the destruction of real jobs. Solyndra, the solar panel company that got a $535 million government-backed loan then went belly-up should be placed in the dictionary and used as a definition as to what happens when politicians and bureaucrats join with businessman to play with taxpayer money. If things get rough across the globe expect eyes to return to problems in Europe, where they continue to talk. I have not written much about the Euro-zone as of late because nothing is really happening. 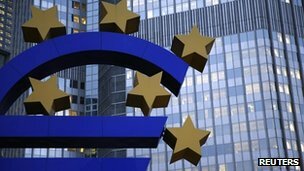 The Euro-zone is engaged in a talkathon, with fear of an immediate collapse off the table the members of the Euro-zone much like their political counterparts in America just talk about solutions without any action. For us in America news from across the pond dribbles out in small doses with almost daily media boost of promises that things are getting better. Little is said about how at a recent EU summit in Brussels Merkel ran into an almost unified wall of opposition from both creditor and debtor countries alike as she pushed for something solid such as using “contracts” to promote economic reforms and address serious issues. Without the fear of an acute crisis that might endanger the euro Germany has lost leverage to move reform along. In the past, countries desperate for Germany’s financial backing quickly agreed to treaty changes to satisfy Angela Merkel and fill her need to placate the judges of the German constitutional court. Germany pushed the idea that countries should sign binding contracts with European institutions concerning promised reforms in exchange for additional economic help. Northern hawks like the Netherlands and Finland continue to be adamantly opposed to additional transfers, fearing they might become permanent. Southern doves rejected the idea of yet more control and over-site of reforms imposed from Brussels, especially if only small amounts of money and aid come with them. The result is a “negative coalition” of the rival camps who opposed the German idea for completely different reasons. Problems in the Euro-zone ultimately stem from the loss of competitiveness in the countries of the periphery where wages have outrun productivity. Germany's wants structural reforms to labor and product markets to get more growth. Voluntary initiatives, starting with the Lisbon Agenda seeking to make Europe more competitive and dynamic have achieved little. The Euro Plus Pact of early 2010, whereby countries would make voluntary pledges that would be reviewed yearly by peers has produced little fruit. The commission’s “country-specific recommendations” are generally ignored. Today many leaders feared the unpopularity of such moves will feed the rise of anti-establishment, anti-EU and anti-immigrant parties before May’s European election. So the idea of contracts have been repeatedly pushed off since autumn of 2012 into late 2014. Merkel will now begin a waiting game, sooner or later somebody will want Germany to commit more money to stabilize the euro zone then she will push her contract agenda through. When it comes to the issue of austerity, governments have found it easier to cut deficits by raising taxes than reducing spending or address the rigidities in the labor and product markets that retard growth. In the Financial Times Mario Monti, the former Italian prime minister, offered two explanations for reform-aversion. First, structural reforms run into organized opposition from groups that enjoy benefits. Raising taxes causes only generalized grumbling. Second, European rules focus primarily on controlling debt and deficits and not the underlying workings of the economy. Countries that have been forced to seek bailouts have already enacted major reforms, In truth the contracts are really aimed at vulnerable countries like Italy and France that have not come under official programs. All that Enrico Letta, the Italian prime minister, would say was that “the time was not right”. France has gone so far as to say the commission should not “dictate” the shape of reforms. As for the long awaited Banking Union, the absence of a permanent burden sharing agreement to end the doom-loop between weak sovereigns and weak banks remains elusive. A recent article in the Financial Times pointed out that progress towards the necessary institutional framework is not the same thing as completion. While a banking union is no panacea for the euro zone’s ills it would ensure that taxpayers of individual countries are not called upon to save the banks, but for this to work there must be some assurance that everyone will stand behind it. The latest draft proposes to maintain the link between banks and sovereigns in the transition period but if the resolution fund runs out of money, national treasuries would have to step in. Currently there is agreement on a bail-in scheme for banks that will involve creditors if a bank fails, but there is no pan-European deposit insurance or resolution scheme with a single euro zone-wide deposit-guarantee system using a common backstop similar to America’s FDIC. While what has been agreed to would transfer to European authorities the supervision of euro-zone banks and the power to handle their liquidation if necessary it fails to address key issues. Even the IMF has warned that a half-baked, piecemeal banking union could be worse than none. Currently the most troubled countries remain vulnerable to bank runs. Worries exist this year’s European elections might generate surprises on the extremes and the independence vote in Scotland if successful could cause problems across the EU. Given the work still to be done at the institutional level and the risk of surprises on the downside, some pricing looks hard to justify. With bonds in some core European markets such as Belgium, the Netherlands and France near pre-crisis spreads they possibly do not reflect financial and economic reality. Unfortunately without a crisis little gets done, it appears the Euro-zone and the world has been lulled into complacency by all this talk. It seems we have already forgotten the lessons of the great financial crisis. Footnote; Please feel free to explore the blog archives and as always you comments are encouraged. Bears Have Reason For Caution! Of course, the market and bears in particular are jumpy. Over the last several years a pattern of a random statements from the Fed and several other sources have caused crazy and illogical rallies. An unholy alliance of the Federal Reserve, the government, and the too big to fail has left those of us who question the validity of the recovery in a precarious position. For the big boys, its insider information and computer trading, this includes computing patterns that exploit where stops are placed, this improves their ability to wash the timid and weak bears out of their positions in this manipulated market. Over the years we have witnessed the type of market reversal the big banks supported by the Fed can generate with a concerted effort to buy S&P 500 index futures at crucial support points late in the day. This has proved more than enough to turn the markets from red to green in the blink of an eye. Even a bad report on job creation is twisted and spun as to mean more Federal Reserve support for easy money policies and a reason to rally the market. It seems no suggestion of weakness no matter how subtle can exist because it may begin to unravel the already fragile consumer confidence. Efforts to escape our economic morass will continue and most likely take an interesting route going forward. A newly released paper from the IMF indicating concern and critical of central banks recent actions should give us pause. In the paper titled “Monetary Policy in the New Normal,” the IMF scolds central banks across the world for their unprecedented use of bond purchases as a tool. The IMF argues many of the world’s leading central banks, notably the Federal Reserve, the Bank of Japan and the Bank of England, have gone too far and the cost of their recent actions seem to exceed the benefits. Much like Fed Governor Jeremy Stein who recently said he would be stepping down from the Fed. the IMF now has come out saying monetary policy should target financial and external stability. Prior to his resignation Stein had been pushing the Federal Reserve to account for just that in setting interest rate policy and has been a leading voice in favor of tapering the central bank’s bond-buying policy which started in December. Looking back few bears saw the end of QE would be a reason for the market to rally, but it did. Note; this is the reason I caution bears to hold back on their celebrations. While those in power, the politicians, central bankers, and the infamous one percenters appear to have painted themselves into a corner more than once, it seems they have super powers that allow the constant creation of new exits so do not be surprised if they have a few more rabbits in their hat. Until now printing money has been their answer, when that fails the power of the pointed finger and the placing of blame should never be underestimated for they are indeed magical. The bottom-line is the higher the market goes the more vulnerable it becomes to a major collapse and sudden downward move. For a long time the wisdom has been to buy market dips and pullbacks. With each new rally I feel a bit of deja vu. Way back in 2007 we saw all stocks moving in unison, always upward, often ignoring both the news and reality, it is happening again. This is a reason for caution! If it looks like a Ponzi scheme, sounds like a Ponzi scheme, and feels like a Ponzi scheme, then it is probably a Ponzi scheme, but that does not guarantee that it is over. The modern economy that has evolved over the last several decades is loaded with interwoven contracts reeking of contagion. If faith drops in these intangible "promises" and money would suddenly begin to flow into tangible goods seeking a safe haven inflation will soar. Never before has mankind diverted such a large percentage of wealth into intangible products or goods. This includes currencies, bonds, pensions, and stocks. I contend this is the primary reason that inflation has not raised its ugly head or become a major economic issue. Like many of those who study the economy, I worry about the massive debt being accumulated by governments and the rate that central banks have expanded the money supply. The timetable on which events unfold is often quite uneven and this supports the possibility of an inflation scenario. A key issue has to do with timing. If the price of gas jumps to $8 a gallon overnight many people will buy gas and not make their car payment because it would be months before their car is repossessed so you buy gas. It is important to remember that debts can go unpaid and promises are often left unfilled. Is this possible and if so where would that leave us? Chaos and major disruption would result from such a scenario. As we have seen from the economic crisis of 2008 and following many other unsettling developments legal actions can continue to drag on for years. Using the analogy of having to go across a bridge, if you are unable to get to the other side you often have a problem. That may be where our economy is. We currently have to get to the other side of a plethora of vexing issues like how well Obamacare will play out, the future of entitlement programs, and how we will deal with paying interest on the growing national debt. A plank breaking under your feet as you cross a bridge may spell a problem but the collapse of the total structure is a disaster. Planning to cross a bridge and getting to the other side is not the same thing. If obstacles develop in the process of crossing it is possible the goal may never be accomplished. Government and financial institutions have built bridges they want us to cross. The rate and ease at which traffic flows across a bridge can change dramatically if faith in the structure is lost or becomes an issue. Much of how society reacts is based on faith in its institutions. History shows that savage economic disruptions and bumps have occurred to society over the decades, still life goes on and it is very likely that tomorrow morning the sun will rise in the east. Please note, if such an inflation scenario were to unfold it could bring new meaning to the phrase "it's different this time" and contrary opinion could becoming meaningless. Even if many people agreed this was coming at us stopping it would be like trying to stop a train hurtling down the tracks. The crux of this article is to reconcile, debunk, and counter the argument that deflation lays before us. This is the claim made by Central Banks to justify and explain how they have massively expanded the money supply far beyond just adding liquidity. If inflation were to suddenly sprout wings central Banks and the government would reach into their toolbox and attempt to produce a series of fast fixes. I would expect these to include things like a "price freeze" and limiting the flow of funds. Remember many debts may go unpaid and promises left unfilled. The history of such actions put in place after a panic begins generally shows them to be far behind the curve. This means many intangible investments could suddenly become very illiquid. There is a major flaw in the concept Modern Monetary Theory. What do you do when it becomes apparent the economic efficiency of credit is beginning to collapse? This means as more money is poured into the system lower rates are no longer effective in driving the economy forward. As the extra GDP growth generated by each batch of loans drops and momentum ends this becomes the equivalent of pushing on a string and is a sign of exhaustion. What I'm seeing is an "almost surreal" feeling of indifference towards reality. Companies have ushered savings from interest paid on their debt into the earning column and a major reason inflation remains low is they are sitting on a hoard of cash this has lowered the velocity of money. The artificially low FED controlled interest rates are a one-time tailwind that is mainly behind us. When rates stop going lower or reverse they will become a major headwind. Predicting or timing inflation, stagflation, or hyperinflation is very difficult. All tend to take a few years to prepare the ground from which they sprout. Inflation in any of these forms develops a positive feedback loop that is sort of a slow-motion panic. A very important thing to remember is that the expectation of inflation can have a major effect on both sides of supply and demand at the same time. When money begins to pursue a product or goods and the price begins to rise those holding that item lose the incentive to sale. In reaction, more money may be pulled out of the closet before the next price jump. This "more money" constitutes an increase in demand. If this happens at the same time items are being held back or removed from retail shelves awaiting better prices which "reduces supply" things can really get interesting fast. This helps explain why hyperinflation is so drastic. Changes in the value of a currency directly affect "buying power" and the value of assets. Trying to predict in which currency a major loss in value will first occur gives us a clue as to where inflation will strike. I don't mean just a little inflation but hyperinflation which could develop very fast. Historically, when hyperinflation occurred people did not understand what was going on, sometimes for years. With blogs, YouTube, Facebook, and other social media it would not be long before people realize the implications of hyperinflation. Once people understand what is occurring the currency dies. This means instead of taking three years, the cycle could go from start to finish in only three months. Some people have been calling for a "world currency" for years and a meltdown with high levels of fear and contagion would present a perfect opportunity to advance this agenda down the field. Many people have a lot to gain when a major shift in the currency markets takes place. Dislodging the American dollar as the world reserve currency represents such a shift. Calls for a new world currency may grow over the coming years if the world stumbles into an economic hell. People and their leaders tend to look for easy answers and this option would represent a new lease on life and a way to lessen the consequences of their past actions. It is very important to remember, we are not the "important people" in how the future unfolds, those in power are the ones that count and everything will be shaped in their favor. Footnote; Please feel free to explore the blog archives and as always you comments are encouraged. This article ties together several posts I have made over the last few months.